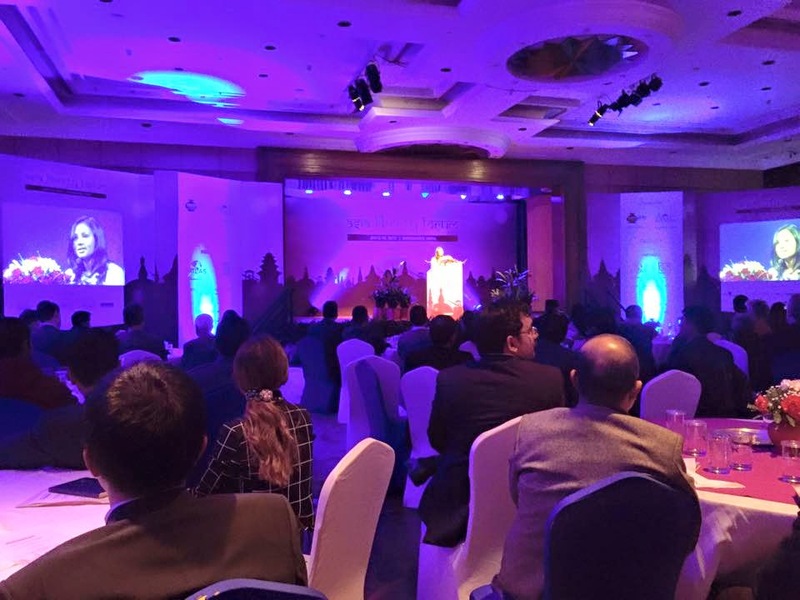 The 3rd Asia Liberty Forum (ALF) officially began last night here in Kathmandu, Nepal, with an Opening Dinner program. Conference venue is Soaltee Crowne Plaza. Big crowd, 200+ people from many countries. All photos here were posted in facebook and twitter by friends, none of them from my camera. Welcome remarks was given by Baishali Bomjon, head of the Asia Center for Entrepreneurship (ACE) and Atlas representative for Asia. Very articulate lady, she discussed the various free market thinkers in Asia, from Lao Tzu to other recent Asian leaders, as well as a timeline of democratization and economic liberalization in some Asian countries. 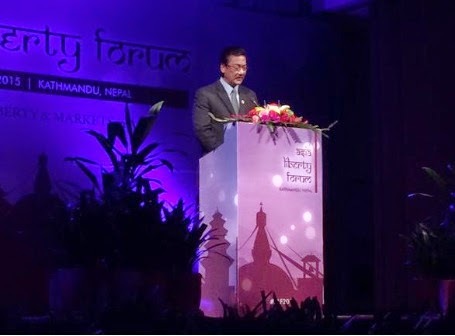 The Welcome to Nepal message was given by Suraj Vaidya, Vice President of the SAARC Chamber of Commerce and Industry, Chairman of the Board of Samriddhi, and Advisor to the Prime Minister of Nepal’s Economic Group. He expressed gladness at the big turn out of participants, as well as the challenges for Nepal to embrace market oriented reforms. 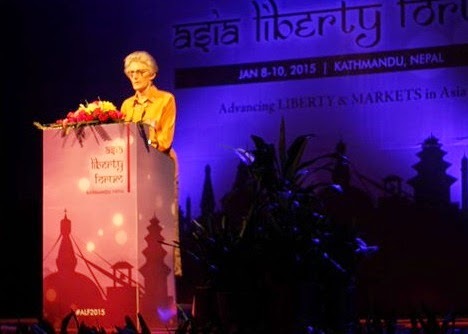 And the Keynote Address was given by Linda Whetstone, Chairman and CEO of Network for a Free Society, Board member of the Atlas Network, the Institute of Economic Affairs (IEA) and the Istanbul Network for Liberty. 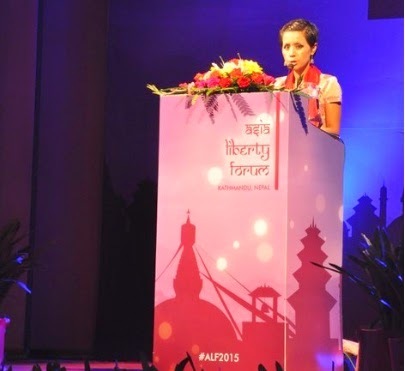 Her talk was on "Investing on the next generation of Freedom Champions". She showed photos of activities by various free market think tanks in educating university students on the value of individual liberty, property rights, rule of law and market reforms. Linda is a fantastic lady, Not so young and yet so energetically active in spreading liberty and free market in many parts of the world. 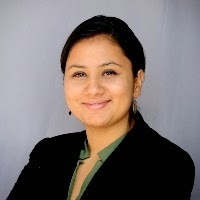 The night's MC was Sarita Sapkota, the Communication and Development Coordinator at Samriddhi. Young, bright and very articulate, she navigated the program so well. A promising free market leader someday. Dinner was great, my first exposure to Nepalese food. A number of EFN Asia "regulars" were there too. 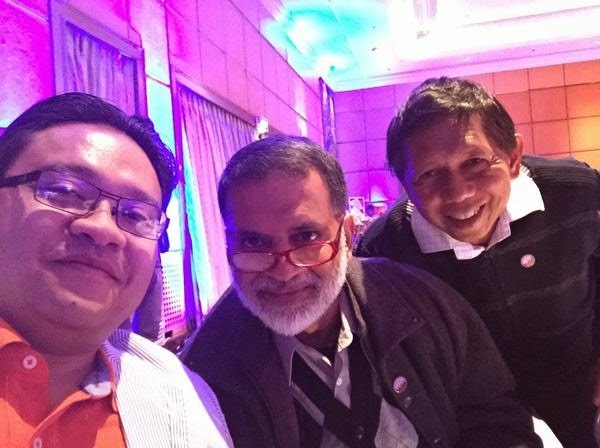 I like this selfie (better yet, "groupie") photo from Wan Saiful's camera phone. 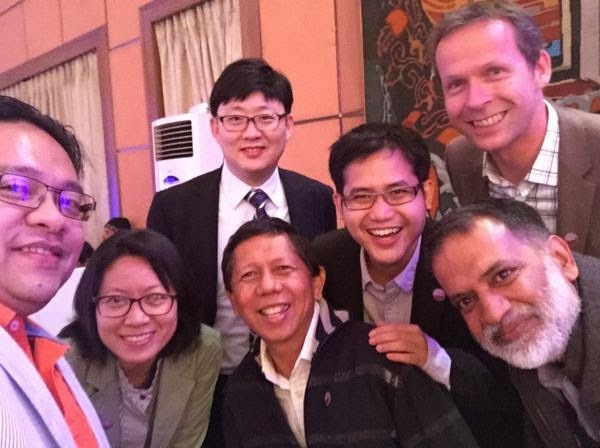 From left: Wan (Malaysia), Wimonpug Promsrimas (Thailand), Peter Wong (Hong Kong), Pett Jarupaiboon (EFN-Asia Regional program manager, Thailand), Rainer Heufers (Germany), Barun Mitra (India), me. Xingyuan Feng (China) was also there but he did not follow quick, so he was not in the photo. Earlier photo, when Wan was teaching Barun how to tweet again. Ok, time to hit the sack and prepare for the conference proper later today.